Stop those temperature spikes and keep your brew temp in check with an all stainless thermowell. Bottom compression cap can be taken apart for cleaning, racking beer or if any problems might occur with the probe getting stuck. Carboy cap NOT included. Just received mine in the mail. The probe for the Johnson A419 controller I own fits perfectly snug in the 3/8" OD thermowell with no modification needed. The 18" version was just the right size for my 6 gallon PET carboy. Great price and fast delivery. Definitely recommend. I had been looking for a thermowell to use with my STC-1000 so I would stop taping to the side of the carboy. Fits snug. I'm really happy with it. I will order a couple more. I have been looking for a thermowell that fit the STC-1000 probe. 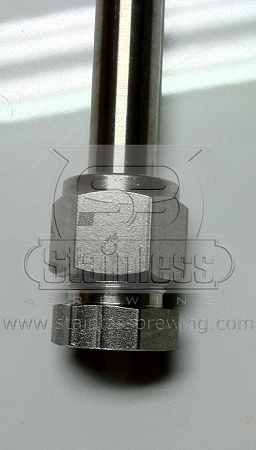 I found what I was looking for in Stainless Brewing's Thermowell. Mine is crafted from 1/2" OD SS giving plenty of room for the probe to be inserted. The compression cap seals the thermowell completely. Sanitize by boiling in wort. 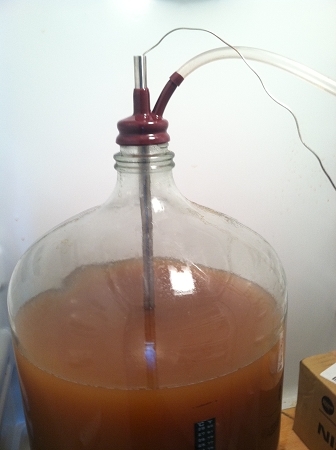 To form the carboy cap over 1/2" tube I used tongs to submerge in boiling water for about 15 seconds and it slid right onto the tube. I could not be happier with this product. 5 Stars from me! Solid, well made, easy to clean, and way, way cheaper than any other you can find on the market. What can be better? I've used this for 2 batches now and have been very happy. I use this with a dual port Big Mouth bubbler, 1 port is an airlock, the other port is this thermowell. I've used this in my chest freezer converted to fermentation chamber controlled by an updated STC-1000 temp controller. The temp probe from my STC-1000 fits in this perfectly. I elected for the 18" version, but if I were ordering again, I might go for 24. Great item for the price.